First up is the Moto Z2 Play, which is $349.99, a savings of $150 from the MSRP (only the unlocked model is on sale). It has a Snapdragon 626 processor with 4GB of RAM, 64GB of internal storage, a 5.5" 1080p AMOLED screen, and a 3,000mAh battery. We reviewed it back in July, and while it was a good device overall, the phone was a regression from the original in a few areas. Next is the Moto G5 Plus, which is possibly the best budget phone on the market. The 32GB model with 3GB RAM is $199.99 ($30 off), and the 64GB model with 4GB RAM is $239.99 ($60 off). Both variants have a Snapdragon 625 processor, a 5.2" 1080p LCD, and a 3,000mAh battery. 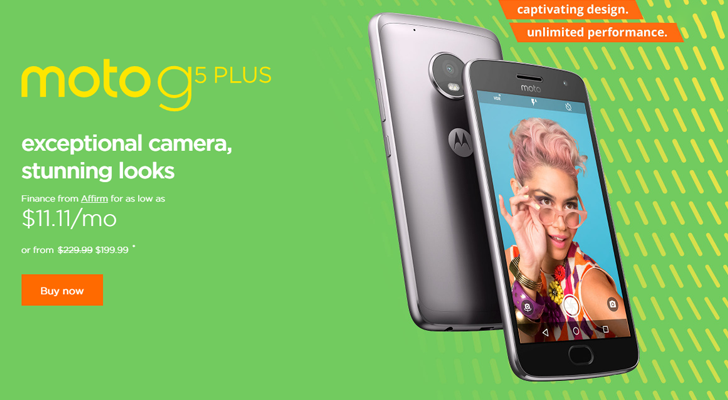 The unlocked Moto E4 Plus is also discounted; the 16GB version is $159.99 ($20 off), and the 32GB is $169.99 ($30 off). Both models have a Snapdragon 427 CPU, 2GB RAM, a 5.5" 1280x820 display, and a giant 5,000mAh battery. You can find our review of the phone here. Next is the Moto X4, which is now $349 ($50 off). This is not the Android One version available from Project Fi; the model sold on Motorola's website runs the company's own ROM, complete with Alexa integration and other traditional Moto features. It has a Snapdragon 630 processor, 3GB RAM, 32GB of expandable storage, 3,000mAh battery, and 5.2" 1080p IPS LCD screen. The last phone on sale is the 2016 Moto Z, which now costs $424.99 ($80 off). Even though it's still plenty fast by 2017 standards, the small 2,600mAh battery means you'll probably have to recharge more often (unless you also buy a battery Moto Mod). This isn't even the best deal we've seen for the phone - it was $399 a few months ago. If you already have a Moto Z phone, Motorola also has every Moto Mod for 25% off (the discount applies when you add one to the cart).